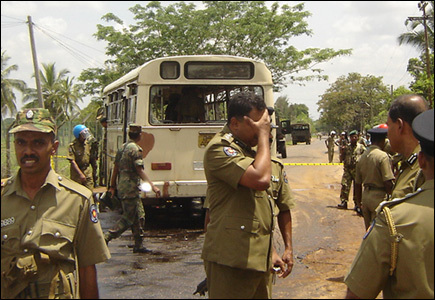 Five Sri Lanka Army (SLA) soldiers were killed and 10 wounded in a claymore attack on a Sri Lanka Army vehicle in front of Joseph camp in Vavuniya, at 12:25 p.m. Saturday, police sources said. The SLA bus was carrying soldiers from Pampaimadu Vanni SF HQ. The claymore was fixed to a two-wheel tractor parked on the road side, at Mundrumuirippu in Vavuniya. 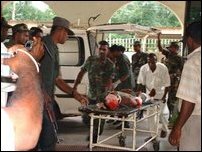 Four of the Sri Lanka Army soldiers who were seriously wounded were taken to the Vavuniya hospital. One of them is in critical condition, medical sources said. The others were taken to military hospital. 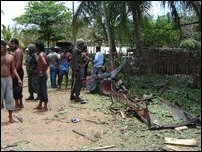 Blast site in Vavuniya, 15 April 2006. Wounded SLA soldiers are being taken to the Vavuniya hospital.